If there is one thing for sure about this Florida State baseball team, it’s that Cal Raleigh is having an outstanding junior season. After not having the best sophomore year, its clear to see that Raleigh has shake-n-baked his way out of the slump. 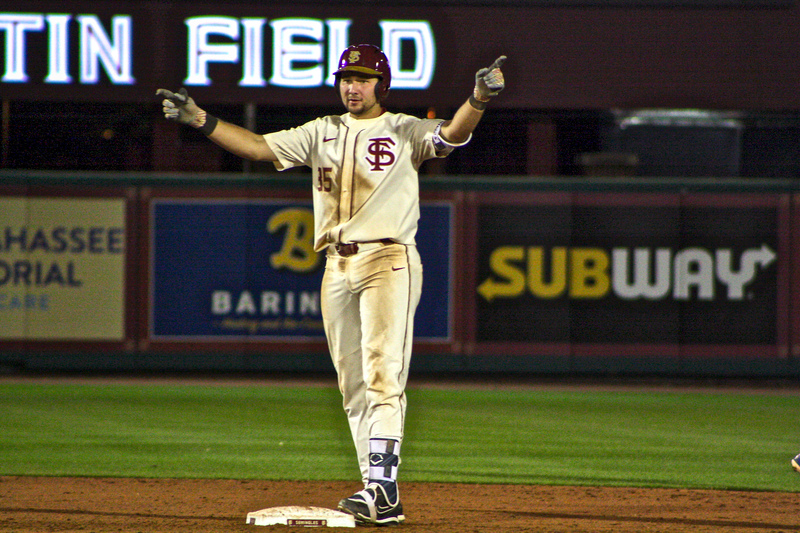 Raleigh is a major reason for the Seminoles’ 33-16 record and things are looking promising for the junior catcher. Cal Raleigh started in all 69 of the ‘Noles games last year and even played as the DH for a couple of games. He finished the season with a .227 BA, 51 runs scored, 60 hits, and 9 home runs. His on-base pct. was at .330 and slugging pct at .398. After having such a stand out freshman year, everyone was hoping for a bit more from the catcher. But, slumps are a real thing in baseball and it happens. What Raleigh lacked at the plate, he made up for it behind the plate. Raleigh is by far one of the toughest players on the team. You can see it in his playing style that he is tough. Ironically, his main walk-up song is ” I Won’t Back Down” by Tom Petty, and that is exactly his kind of mindset he has for every game. Of his 60 hits, Raleigh had 14 multi-hit games. His first home run of the season came in late February against Jacksonville, where he helped the ‘Noles rally back from being down and end up winning 6-5. Another exciting moment from Cal’s sophomore year was hitting his first triple of the season against FGCU. He was also responsible for hitting the go-ahead run against UNC at the ACC Tournament which helped Florida State win the game and clinch their seventh ACC Championship title. At the College World Series, Raleigh notched three hits. This including a home run in the ninth inning against LSU where he and Quincy Nieporte hit the first back-to-back home runs in CWS history at the new TD Ameritrade Park. Showing true resilience from last year, Cal Raleigh has made his junior season at Florida State nothing less than extraordinary. As of May 10th, Raleigh is batting .313 with 34 runs scored, 55 hits, and the teams’ second best 9 home runs. He is leading the team with 40 RBI’s and is second in the ACC with 43 walks on the year. Raleigh has also thrown out 13 players attempting to steal bases. His stats have extremely improved since last year and will only continue to improve from here. Raleigh has been ranked in multiple preseason and midseason awards list. He was a Preseason All-American 2nd team for Collegiate Baseball and 3rd team for Baseball America. Raleigh is No. 60 in the D1Baseball Top Prospects rankings and even jumped to No. 52 in their Midseason Top Prospects rankings. Cal Raleigh is also on two watch lists for the Golden Spikes Award and the Johnny Bench Award. There have been many recognitions and awards for the junior who deserves every single one of them for how much hard work and dedication he puts into this FSU baseball program. This past weekend at Clemson was just the beginning of what is going to be a great final stretch of the season for Raleigh. He went 8-for-13 at the plate against the Tigers and even had his second multi-HR game of his career. His first time hitting two home runs in a game came just a week before against Stetson. His batting average has jumped tremendously from where it was at the end of last season. He has already matched his sophomore season home run total at nine and there are still seven games and postseason left to go. If Raleigh keeps up the games he’s been having, he could potentially double most of his stats from last season. One of the unique things about Cal Raleigh is that since he played in his first game his freshman year, he has started in all of them adding up to 173 consecutive games. All of 2017 he started behind the plate as well. The fact he has been able to start in that many games is incredible, especially for a catcher. Being a catcher requires a ton of strength and durability, which the ‘Noles can always count on Cal Raleigh for. Cal Raleigh is draft eligible after this year and whether he will go or not is unknown, but highly likely with the amount of talent he has. 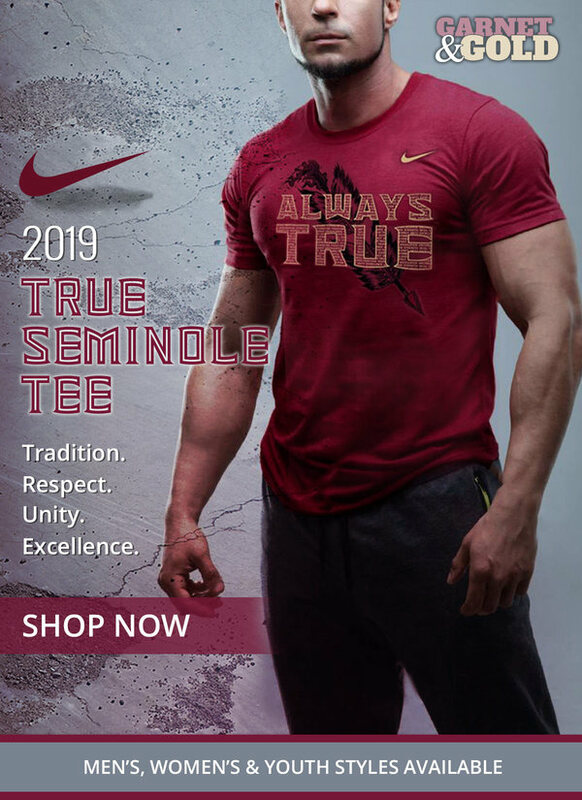 His career at Florida State has been an incredible one. He is a huge part of the starting lineup and you can tell how highly coach Mike Martin thinks of him. Having such a strong catcher behind the plate is a crucial part of any baseball team, especially one that wants to be as successful as Florida State is known to be. Cal Raleigh will have many more opportunities to break his career high in home runs the rest of this season. FSU fans can expect to possibly see that broken this weekend as the ‘Noles take on Mount St. Mary’s in a four-game home series. Raleigh will only continue to add to his consecutive starts this weekend but we could definitely see him starting behind the plate or also as the DH. His versatility at both positions is what makes him such a great team player and a big factor in adding to this FSU team’s success. One thing for certain is that Cal Raleigh has many more years left and the chance at a legendary career playing the great game of baseball. ← Previous Story Can Madison County Send Another Player to Tallahassee?